Every year millions of dollars’ worth of produce is damaged, lost, or never produced due to frosts. Frost causes the plant’s new tips and buds to be damaged due to the formation of ice crystals within the tissues, rupturing cells. As a result, new plant and fruit growth are severely inhibited. The majority of producers still utilise costly, and often ineffective, traditional methods of frost avoidance. Creating inherently Frost-Resistant crops will increase yields and will allow farmers access to crops previously unable to be grown in certain regions. Market Pain: What market problem does this technology solve? Currently, many industries in agriculture suffer large crop losses due to snap frosts. This project has the potential to reduce frost damage to existing crops and introduce crops which cannot be used due to threat from frosts. Solution: How does the technology solve this problem? We can provide the technology which could be developed into future frost resistance crops. Growers will have higher yields, increasing supply, reducing costs for consumers and increasing profits for growers. Growers in regions with frequent frosts would also have increased access to crops previously off limits. These mechanisms will be intrinsic to the crops so while solving the frost problem this also reduces the reliance growers have on alternative mechanisms of frost protection. Potential Applications: Potential applications for the technology. Crops which are currently susceptible to frost, especially those relevant to New Zealand’s economy such as Grapes, Kiwifruit, and Stonefruit. Other applications include crops currently not grown in large volumes in New Zealand due to the difficulty with climate including papaya and bananas. It is possible that this technology could be applied to non-human crops such as cow feed to aid in feed shortages during winter. Project Budget: How much will this portion of the project cost. Estimated time to market: When is it likely available for sale. 5-7 years to first crop. A further 2-4 years for crops under human consumption. Project outcomes: The target outcomes of this project. This portion of the project is a pilot study investigating frost resistant mechanisms. The target of this portion of the project is to characterise frost resistance mechanisms to see if investing the resources to put them into crops would be worthwhile. The long term project outcomes will be producing the template seeds of frost resistant crop plants which could then be licensed to / produced with a seed producer. We have met with a UniServices IP advisor and were advised our current portion of the project is not patentable. Future portions of this project may be defendable. One potential avenue for this involves patenting transgenic seeds once they are created. This has been done before by Monsanto and this form of patent has recently been held up by the US Supreme Court. Further analysis may validate this as a potential avenue. The proposed strategy is that at the conclusion of a PhD, completed with the data produced during this initial portion of the project, seeds for frost resistant crops could be patented. These patented seeds could then be licensed to seed producers. Alternatively, the producers of this patented seed could go into a partnership agreement with a seed producer. This is up to the IP owners at the time. We aimed to characterise the candidate protein, DaIRIP4, in a plant chassis and are presenting this work in Boston as a requirement of the iGEM Competition. This leads to a completed data set on this frost resistance mechanism which could then be transferred to the next stage of the project, assessing its effectiveness against other frost resistance mechanisms. The target market for this project is large seed manufacturers who would license the seed design for mass production. The customers of this product would be farmers all over the globe. Worldwide there is a constant uncertainty around genetically modified organisms (GMOs). Each country has their own views and laws on the subject, but the need for them is becoming more apparent. Climate change, a growing population and profit are drivers of the market expansion. New Zealand has not allowed the cultivation of these crops because their fragile ecosystem but other countries such as America are embracing the idea. More than half the EU has recently banned modified crop cultivation (Coghlan, 2015) yet they continue to import the crops products, meaning although these countries do not grow the plants the market for GMOs is still available. Presently distributed GMO crops include species of maize, soybean, cotton, and canola but other vegetables have also been produced (Yuen-Ting Wong & Wai-Kit Chan, 2016). Fruit is not a common modified organism but with the looming threat of climate change farmers may have to change tact. At the beginning of the year France’s total wine output fell 10% because of frosts, having losses of up to 50-100% of crops in some places (“french winemakers”, 2017). Leominster in England had no peach crops (Jasinski, 2017) and New Jersey in America (Pickels, 2017) had a decrease in plum crops in 2016 because of the same reason. New Zealand may even have to start thinking of expanding their laws on GMOs as morning frosts are becoming more unpredictable. Kiwifruit are quite susceptible to frost and they are a major product of New Zealand, this could have a profound effect in future. This is already causing difficulty for another major producer, Italy, that lost 70% of its kiwifruit in the region of Lazio due to frost in 2016, some orchards losing 100% (“Italy: Up to 70% of Kiwifruit”, 2017). China are also main producers of this fruit and have allowed the cultivation modified plants (James, 2014). There could be an avenue for selling to growers in the colder northern China. The crop damage from frosts have been shown to cause major product loss. But also, the extents farmers go to prevent this occurring, such as heaters and fans and in some cases the downdraft from helicopters, may be equally as expensive. Marketing the financial and practical benefits to governments and farmers could open better possibilities for them. James, C. (2017). Global Status of Commercialized Biotech/GM Crops: 2014. International Service for the Acquisition of Agri-biotech Applications, 49. Yuen-Ting Wong, A., & Wai-Kit Chan, A. (2016). Genetically modified foods in China and the United States: A primer of regulation and intellectual property protection. Food Science and Human Wellness, 5(3). Farmers have a variety of existing mechanisms to deal with frost. These come in a variety of active and passive forms. One passive form of frost protection is site selection. Farmers will look for land with good air drainage and a close proximity to naturally occurring heat sources such as rivers. High quality land is often limited by price and sections requiring increased upfront investment will require a greater return. The exact cost differences fluctuate and would require further market analysis to quote. Another form of passive protection is selective breeding. Produce selectively bred to be frost resistance does exist on the market e.g. Semini’s ‘ice pack pea’ though the one of cost for these seeds can be high due to the long time to market selective breeding requires. Initial patent searching and market analysis showed no current fruit seeds on the market which were selectively bred for frost resistance or genetically modified seeds for sale with inserted frost resistance mechanisms. Simultaneous growing of two different species of crop can allow for a frost intolerant crop to be covered by a taller, more frost tolerant crop. This method has limitations in terms of crops that can be grown in unison and are not overly competitive. This can also reduce radiation absorption from the sheltered plants so there is a balance of when to use this and when not to. Coverings are another noted way that heat loss through convection. There are large labour and supply costs associated with the implementation of this method so tends to be used on smaller plants and gardens. At the Mitre10 website a frost cloth 1x20m is $8.98. Protein sprays are a recent innovation developed by students in Canada (Ali, 2017). The protein coat, when sprayed over crops will temporarily insulate the crops while allowing sunlight to enter the plant. A second different spray application can break down this initial spray into nutrients which can be absorbed by the plant and soil. There are no quotes currently on how much this product would cost. Active forms of frost resistance vary in cost and effectiveness. Sprinkler systems are used by many growers to combat frost due to their low running costs (Snyder, Melo-Abreu, & Matulich, 2005). A small labour cost is required to turn the valves for these mechanisms on, with a relatively small amount of power consumption, and most farmers implementing this system having access to free (or very close to it) fresh water. Implementation costs are relatively high but can be earned back if the same system is used over multiple seasons. Exact costs were difficult to source so further market validation is required. Heating systems operate similarly, being switched on just before frosts occur. According to one sprinkler system developer, the expenses for each acre are $495 USD (Fontela, 2013). Independent analysis is required to assess whether this is accurate. 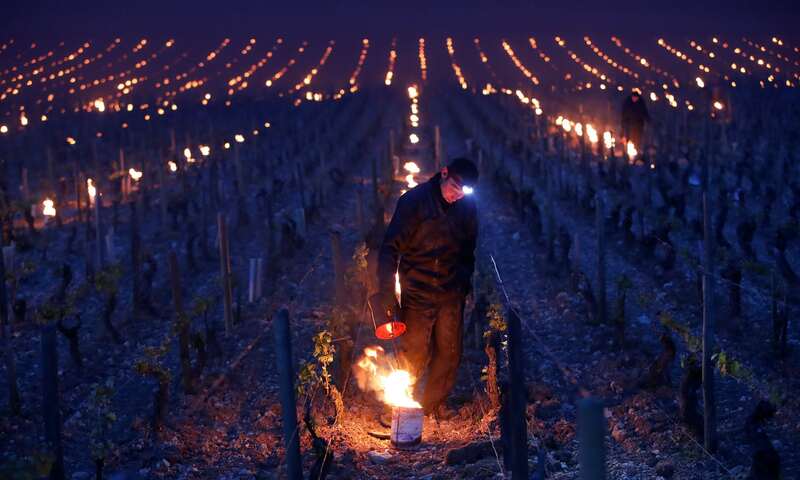 Similar to this, Candles are sometimes used to protect grapes from frost. This is a traditional method used in some areas for generations for striking effect. It is not clear how effective this method in comparison to more modern methods but there is a large labour cost associated with its implementation. Frost fans are another commonly used method for combating frosts. Permanent fans are often placed in orchards where the same crop is grown year on year. These are expensive to install and maintain and have been known to cause controversy in some communities due to the large amounts of noise they generate early in the morning when they are switched on. One company, sells their SIS frost Protection System for between $3000 and $6000 per hectare (Moss, Date Unknown). An alternative to this are smaller, transportable fans which can be cheaper initially but can result in larger labour costs. A number of small New Zealand firms sell these fans e.g. Tow and Blow, which cost approximately $40,000 according to one source (ASB Blog, 2017). Helicopter flyovers are also implemented by some growers, with the civil aviation authority having developed guidelines for wine growers using this method to protect from frosts (Civil Aviation Authority, 2017). Precision Helicopters Limited is one emergency service that can fly helicopters over a section providing emergency frost resistance. We have contacted PHL and are awaiting a quote from them for covering a small vineyard. Further market analysis is needed to assess how these methods compare to one another in both effectiveness and cost. It is clear that many of these mechanisms are incredibly costly for farmers but act to give growers peace of mind that their livelihood will not be ruined by one poor season. More market analysis is required. Zespri have a supply chain which we could potentially model our production on. Zespri supplies the seeds to their growers which grow the product which then goes from the farmers back to the company for processing. The product then moves onto the supplier, mainly supermarkets. Because our seeds must be manufactured, it is likely we would go through a company with the infrastructure to do so. There are four dominant biotech companies we may considering a partnership with; Monsanto, Bayer, Dupont and Syngenta. The Jamboree in Boston would be an enormous opportunity for networking with some of these companies. Many large companies scope out ideas worth investing in through this competition. Establishing a relationship early would assist in the funding and development of this technology. This partnership could take a variety of forms. We could sell the rights of the seed to the producer, who would then sell the seed to growers through a company like Seminis, owned by Monsanto. We could also use a model similar to Zespri by partnering with a biotech companies to make our seed, then selling it to farmers ourselves. To make this decision, further market analysis is needed. Genetically Modified Organisms have different definitions and standards for human consumption around the globe. This would likely impact the companies we could partner with and the growers we would target. While domestic views of GMOs are slowly changing, the New Zealand Government’s restrictions on growing GMOs would greatly impact the ability to plant GMO crops in New Zealand soil. While GMO crops can be sold in New Zealand, they must be approved by the food safety authority and must comply with labelling laws. In comparison, the USA is far more lenient with GMO cultivation. For example, over 90% of the current corn crop is GMO. There are no independent restrictions on GMOs, instead the products are regulated with the same standards as conventionally grown crops. The differing perspectives of governments and peoples to the growth of GMO crops will greatly impact the locations where frost intolerant produce could be grown. Further market analysis is required here to assess the extent to which this may limit the growth potential of this project. This would be down to the licensing agreement agreed on by all parties though an estimate could be $1.688 million. An estimate is $8.44 million in increased exports from kiwifruit alone. A loss of 1% of the total crop due to frost per annum for 5 years would be a loss of $1,688,000,000 x 0.05 = $84.4 million. Even a benefit of 10% increased frost resilience would save $8.44 million over 5 years. This is just an estimate for kiwifruit. The licensee, now receiving 1% more crop per annum, would receive the economic benefit of this minus the costs associated with implementation. This value is significantly less clear as the costs of different crops varies so wildly in this regard. The pilot study proves a success. There is a PI and a PhD student who want to continue this work. More investment will come as this project grows. This isn’t being worked on by a large company already. Time Constraints Our project only runs for the span of a year. For it to reach its full potential, the project would have to be developed into a PHD project. There is potential for the project to be continued as a PHD project. We need to connect with those academics and researchers who could continue this. IP The barriers to getting IP rights on our product/technology is unclear. Our research so far has been inconclusive, and we need further professional guidance regarding this. We have to seek further guidance regarding the IP rights to our project. We have been advised that this portion of the project is not IP protected but it is likely that future portions of the project will be. Commercial Companies may be unwilling to invest in these ideas to a commercial level as a result of this technology being novel and the public's reactions not being known Seeking to collaborate with companies while in the development stage will ensure the final seeds produced have the best chance of success in the marketplace. Regulations New Zealand is behind other countries in terms of embracing G.E Currently our technology would have no place in the New Zealand market. The regulations are being re-thought, but this is generally a time consuming process. In the time the project takes to get adequate results, it is hoped that New Zealand will become more tolerant of G.E technologies. Currently the regulations regarding G.E is being reviewed. Also, our technology has global potential, and could be targeted towards other markets whom embrace G.E. We decided to make the business aspect of science a cornerstone of our project this year. Through the hard work of our fundraising team, we were able to entirely fund this project without having to go into our own pockets. This is important to us as we didn't want finances to be a barrier to access to science. Thank you to all of those organisations and people who made this dream a reality. Find out more about those who supported us.